Fans were pleasantly surprised when the BB-8 robot from Star Wars: The Force Awakens rolled out onto the stage at the Star Wars Celebration last week. Like, "That thing is real?!" Naturally most people's next thought was how badly they wanted one of their own, and luckily the company behind BB-8, Orbotix, is going to deliver. Orbotix is the maker of the Sphero, a toy robotic ball that users control from their smartphones. 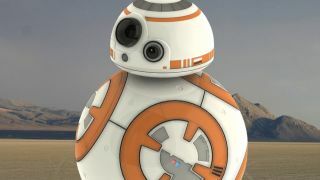 Orbotix provided the technology behind the version of BB-8 used in the new Star Wars film, and the company is also designing the toy version, reports Gizmodo. Based on a Fat Brain Toys page that went up earlier today and was promptly deleted it seems the consumer BB-8 will launch in September for around $150 (about £100, AU$195). That's unconfirmed, though, and for now the only official word is a gosphero.com landing page with a BB-8 silhouette, the sentence "This is the droid you're looking for," and a form to enter your email address and receive updates. Coincidentally - or maybe not, who knows? - a designer named Christian Poulsen revealed over the weekend that he had made his own jury-rigged BB-8 by slicing a Sphero open, inserting a magnet and putting a counter magnet inside a head made of what looks like styrofoam. You might not have a spare Sphero lying around to experiment on, though, in which case it seems you'll have to wait until the fall to terrorize pets and small children with your very own real life BB-8.